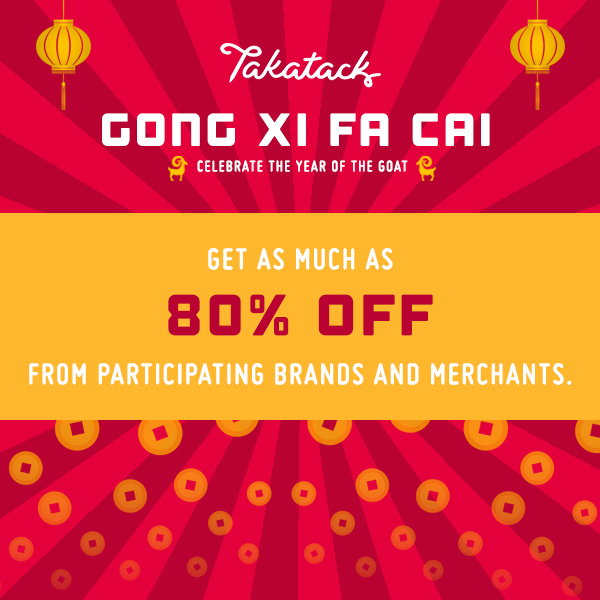 takatack chinese new year sale! Takatack will be having a Chinese New Year Sale! from February 10 to 19, 2015 with discounts of up to 80% on big brands! Get up to 80% OFF on brands such as Nurture Nook, Tinker and Play, One Stop Shop Gadgets, Lala Garcia, Pulse Creations, Re-Create, and The Lovemark. Discover products from brands that inpsire, and find a wider option of gifts for your special someone, from Manila Sole Footwear, Fledge Clothing, Jump Lifestyle, Cogito, Cocotini, Jacinto and Lirio, Borabound, DCG Fashion, Shop London UK, The School of Satchel, Shopaholic for Kids and many more! Plus! Get an additional Php 300 discount when you use the coupon code CNYSALE upon checkout. The coupon code is valid for P1500 minimum purchase, one time use and is valid until February 19, 2015. And make sure to come back and visit www.Takatack.com on February 19 for their hourly sale!